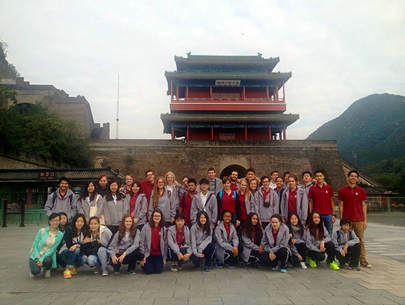 Last week, thelanguage classes at Beijing No 80 high school took a trip to the great wall. 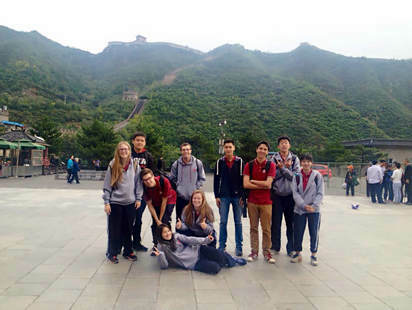 Weset out at seven in the morning, and took a school bus for two hours to Juyongguan,a mountain pass on the outskirts of Beijing. After getting tothe wall we took a group photo, and then started to climb. The wall at Juyongguanis very steep, and the different steps are all different heights, so we had tobe very careful while climbing. It had rained earlier in the day, so the stepswere slippery. After getting to the highest part of thewall, we stopped to rest outside one of the watchtowers and look out over thesurrounding countryside. Dark green mountains extended far into the distanceand the wall curled up the peak on the opposite side of the valley like agigantic snake. We also noticed a small town nestled in one of the valleys,with little houses and gardens. Students took a lot of pictures of thebeautiful scenery. Thegreat wall is one of the most important monuments in Chinese history, both forits symbolic and practical purposes. Built over multiple dynasties and hundredsof years, the wall marked the Northern border of ancient China and symbolizedthe power of China to he rest of the world. It also functioned as a practicaldefense mechanism to shield China from Northern invaders. 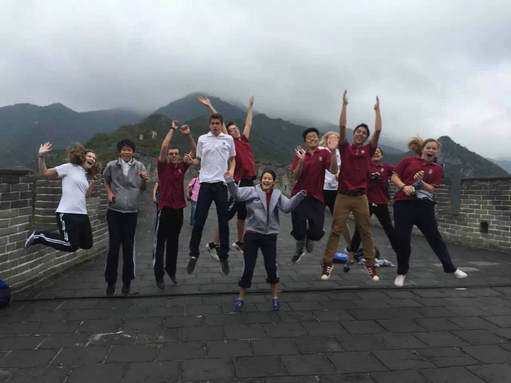 All of the studentswere impressed that people in ancient China had the ability to build such astrong and effective wall. Outside one of the wall towers, there was a Mingdynasty iron cannon, one of the strongest weapons of the era, pointed out ofthe North end.